Is your neighbor’s yard beautiful? Spiffy? Eye-catching? Hot? Nominate that creative, hard-working person for the Third Annual City Pride Residential Landscape Contest! In addition to bragging rights, of course, the top prize is a beautiful custom bronze yard stake crafted by Kaviar Forge! 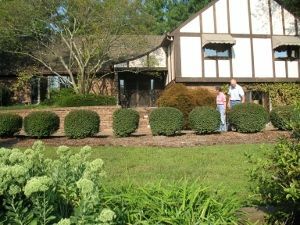 (Is your yard awesome? Find a friend to nominate you!) Click HERE for the nomination form. Ted and Bonnie Cummings stand in front of their landscaping which won the 2012 Residential Landscape contest sponsored by City Pride. City Pride is a non-profit volunteer group whose mission is to support the beautification of Jeffersonville.